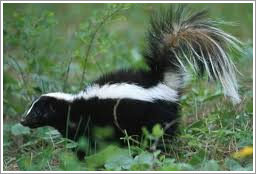 We recently learned of an unfortunate Waukesha family who got into a terrible stinky mess with a family of skunks. The skunks made a home for themselves under their deck. The smell was so terrible that the family had to move out of their home. They hired an extermination company that repeatedly had to bomb the area under the deck, which didn't work to remove the skunks. They finally had to remove the deck completely, clear out the skunk's home, and then replace the deck. The claim was well over $20,000 to exterminate, repair the deck and clean all home items that still reeked of skunk spray. Is a skunk a rodent and therefore excluded under the homeowners’ policy? Is there coverage for any of the damage caused by the skunk? The standard homeowner's form excludes coverage for damage caused by vermin, rodents, birds, or insects. Birds and insects are readily identifiable; it's the rodents and vermin that cause the problem. “Rodent” is a scientific classification; according to Merriam Webster Online a rodent is any of an order (Rodentia) of relatively small gnawing mammals (as a mouse, squirrel, or beaver) that have in both jaws a single pair of incisors with a chisel-shaped edge. Biologically speaking, every living thing is classified by Kingdom, Phylum, Class, Order, Family, Genus, and Species, so once you determine a creature's order, you know whether or not you have a rodent. For the record, skunks are not rodents, so there is coverage for skunk damage to the dwelling.